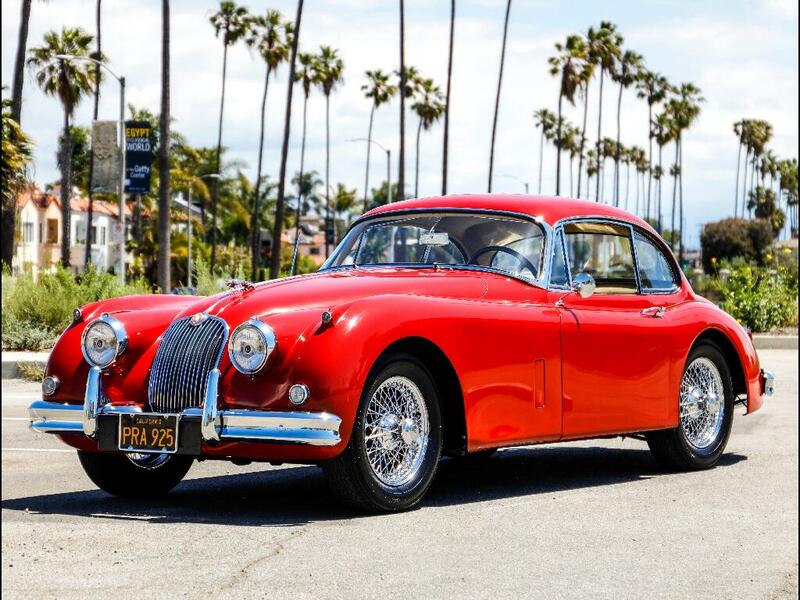 Chequered Flag International is pleased to offer this 1961 Jaguar XK 150 3.8 liter Coupe in Carmen Red with Beige leather interior. 65,213 original miles with four Southern California owners from new (see below). Only the very last of these had 3.8 liter engines. This is the last one imported to the US and the 2nd to last 150 Coupe built (see Heritage Certificate Below). According to Peter Ingram registrar of all Jaguar XK's this is the last known XK of the XK120/140/150 era of any model. All matching numbers. Essentially a totally original car. Perfect rust and accident free body with, as best as I can determine, lovely original paint with some buff through mainly on the roof. The passenger side rear quarter might be the only exception to this claim. Fantastic interior with original dash, door panels and roof liner. Seats and carpets from BAS Jaguar trim specialist were installed in 2000, they're correct and in perfect shape. Mechanically superb. We just went through it fitting new stainless exhaust system and giving it a very comprehensive check over and service, including carb rebuild, new belts, hoses, brake fluid, oil and filter, etc. History: Sold new in 1961 to Appel Slaten Development Co. real estate developers on Sunset Blvd Los Angeles CA, they owned it for only a year. In 1962 it was purchased by Harry and Jane Campbell of Lomita CA who owned it till 1989 (27 years), 3rd owner Keith and Patricia Tucker of Carson CA from 1999 till around 2014 when a friend of ours bought it and put it in his collection till we purchased it from him. Documentation: California registrations from ‘62 to 2010, records form ‘85 to 2003. Original Yellow and Black license plates issued in '61 plus the Black and Yellow plates issued in '62. Original handbook, tools, jack, spare, grease gun, hammer, etc. This has been treated as a collector car since the 60's and I would go as far as saying it’s one of the best and most original XK 150 Coupes In existence. Inspections encouraged. All sales AS-IS. Sales tax and license fees due if delivered in California. Message: Thought you might be interested in this 1961 Jaguar XK 150.